These IOT traffic innovations range from Wi-Fi Vehicles to Smart City parking platforms that make one's morning drive to work smoother. As smart cities become increasingly more connected, platforms like parking-finding beacons, smart traffic lights and even holiday shopping sensors are enhancing people's quality of life. While intuitive parking platforms like Kiunsys monitor and manage urban mobility, mobile platforms like the Automatic app utilize iBeacon technology to help users pay for parking and gas via their mobile device. Kiunsys locates the closest parking spots in one's vicinity, making one's drive to work faster while the Automatic app decreases wait time in parking payment lines and at gas stations. Both examples increase user convenience and ultimately decrease traffic in large urban centers. Other memorable examples from this list of IOT traffic innovations include Aalborg's Christmas shopping sensors that track the Danish city's mall traffic along with London's Smart City crosswalk signals. 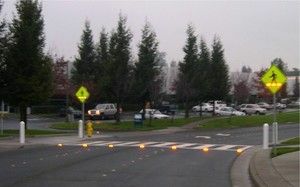 While Aalborg's customized sensors help shoppers avoid congested malls and traffic jams, London's Smart City crosswalk signals calculate the exact amount of time needed for lights to be on. This is decided in accordance with the number of people that are crossing the street at a particular time.